The sitemap optimization package includes two primary components: a web broswer user interface and command-line bash scripts. Each of the components are described below. For installation instructions, see the Installation Guide. /env.sh - Defines the environment variables for the bash scripts and the web browser interface. These configuration variables usually need to be set only once on installation. /config.init - Stores the default sitemap configuration variables and is the base for custom-defined configuration files. This file should be copied to the config directory and then edited to define the sitemap.sml configuration variables. Multiple configurations can be defined for separate domains or different directory structures. Each configuration file corresponds to a single sitemap.xml. /generate_filelists.sh - Creates the data files used by the web browser interface and bash scripts. Scans the web server directory for all files matching the selected file types, sorts the directory tree, parses sitemap.xml for a list of all current sitemap files, generates a list of newly created web pages by comparing the complete directory tree with the current sitemap and files excluded from the sitemap. /sitemap/ - Destination directory for sitemap.xml and the sitemap urllist. Any active sitemap.xml can be copied to this directory so that it will be parsed to identify the currently included web pages. /data/ - Destination directory for data files generated by the bash scripts and the web browser interface. 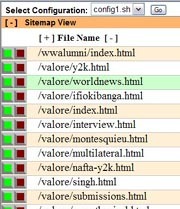 For each sitemap there are four data files: (1) the complete server directory tree as defined by the selected file type extensions; (2) the current pages included in sitemap.xml; (3) the list of pages excluded from the sitemap; and (4) a list of pages created since the last sitemap.xml. /php/index.php - The start page defines the overall display. It contains four display sections: (1) a menu for selecting or creating a sitemap configuration; (2) a display area to list and edit the sitemap URLs; (3) a display area for the server file and directory tree; and, (4) a display area to edit the sitemap configuration file. /php/config-read.php - Reads the selected configuration file and defines the environment variables for all php components. The configuration file is read by both the bash and the php scripts and is in bash format. /php/config-edit.php - Displays the configuration file in the browser. Configuration variables can be edited and saved from the browser. /php/config-save.php - Saves configuration file changes, creates new configuration files, and runs the server script to create the data files. /php/filelist-edit.php - Displays the web server directory tree and selected URLs. Web pages can be enabled for inclusion in the sitemap, or disabled and excluded from the sitemap. New pages created since the last sitemap are displayed in green and excluded pages are displayed in red. Links to the URLs lanuch the actual pages in a separate browser window. /php/filelist-save.php - Saves the files that have been excluded from the file list. /php/sitemap-edit.php - Parses the current sitemap and displays a list of URLs in the browser window. Newly added URLs selected from the server directory tree (see filelist-edit.php) are appended to this sitemap list. Each URL displayed can be launched in a separate browser window, and their respective sitemap priority and change frequency attributes can be edited. /php/sitemap-save.php - Saves three separate files: (1) a sitemap file in XML format as defined on sitemap.org; (2) a urllist file including the priority, change frequency, and last modified attributes that can be read by the popular google-sitemap_gen script; and, (3) a text file containing the fully qualified file names contained in the sitemap.xml. /css/is1main.css - The style sheet definitions for the web browser interface.